Leonard Knight, creator of a spectacularly colourful art environment covering a hill in the Imperial Valley Desert of California, died on February 10, 2014. 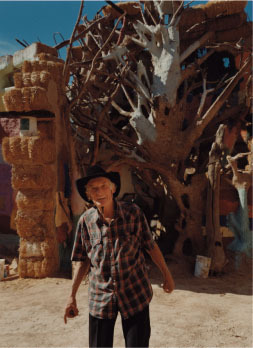 Knight spent three decades constructing Salvation Mountain by hand using local adobe clay, straw and thousands of gallons of donated paint. 50 foot high and 150 foot in breadth, his masterpiece incorporates biblical and religious scripture and is adorned with flowers, trees, waterfalls, suns, bluebirds, and other colourful imagery. Knight's main message, “God Is Love,” transcended religion, and he hoped that his creation would be preserved as an expression of this message for future generations. Salvation Mountain, Inc, the volunteer project that preserves the site, intends to continue Knight’s mission of carrying God's unconditional love to the world. We celebrate 25 years of Raw Vision magazine in issue 81.
weaponry of celebrated Art Brut artist Andre Robillard. Self-taught artist Johnny Culver's intricate graphic universe. The visionary and very personal anatomy of striking Czech artist Lubos Plny. The obsessive mosaic creations of Jim Powers, "Gaudi of the East Village." 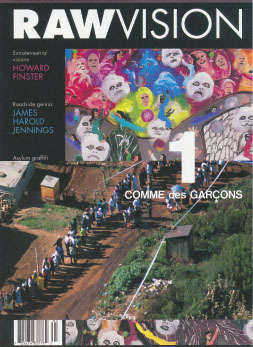 Interviews about two celebrated European artists, Hans Krusi and Theo. Late paintings by Donald Pass, the English painter of celestial visions. 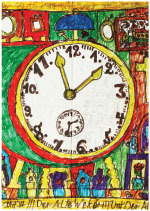 Art Brut, opens in Portugal. The powerful portraits of the self-taught artist from Liberia, Johnson Weree.